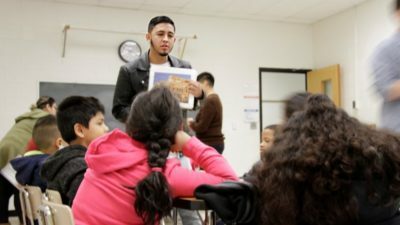 WAMU Reports on Reading Gains Among Latino students – Identity, Inc.
WAMU reporter Sasha-Ann Simons reported on the tremendous leaps in reading that Latino youth enrolled in Identity’s elementary school reading and social-emotional program are making. This is a great reminder of the Promise of Latino Youth and that it IS possible to close the achievement gap in Montgomery County and beyond. Did you know that students enrolled in Identity’s Jóvenes del Mañana program made big strides with 45% reaching or surpassing their on-grade-level reading and 52% making gains toward this goal, while also building self-control, persistence, and social competence? The program is now serving students at Clopper Mill, Daly, Stedwick and Whetstone Elementary Schools.